Getting to know Sammie better. Every day. She knew the times we would feed her. She began hanging out more around our house and this was important to get her in a routine. As well, to make sure we did not feed her during the hours when raccoon, possum or whatever other animals would come out and eat her food instead. We never left food out after dawn and before dusk. She was using the little house, but was hesitant too. I know we did not have a rear exit for her. I heard cats like a home where they have 2 places to exit so they are not corned by predators or people. She likes to hang out in a spot in the corner of the fence where she would be dry under a tree and watch us in the window. She was always staring at us in our dining room window. We were using the treats to get her to come closer gradually. She seemed to be trusting us a bit more. One day I was beginning to get her so close to me to feed her, it was incredible. I touched her and she let me pet her. Wow!!!! She even arched her back. I was learning how cats liked to be pet, really for the first time. It was obvious she had people contact before and was not a true wild cat. The word feral cat is used in many ways. Sometimes I see it as meaning never touched by humans, and other times just living outside. 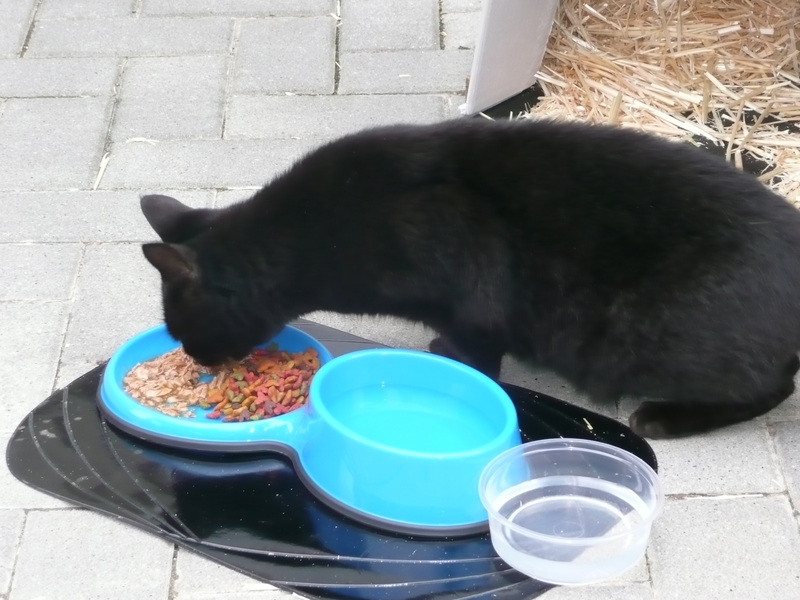 I found this description: A feral cat is a domesticated cat that has returned to the wild, or the descendants of such an animal. It is distinguished from a straycat, which is a pet cat that has been lost or abandoned, while feral cats have never been socialized. The offspring of a stray cat can be considered feral if born in the wild. 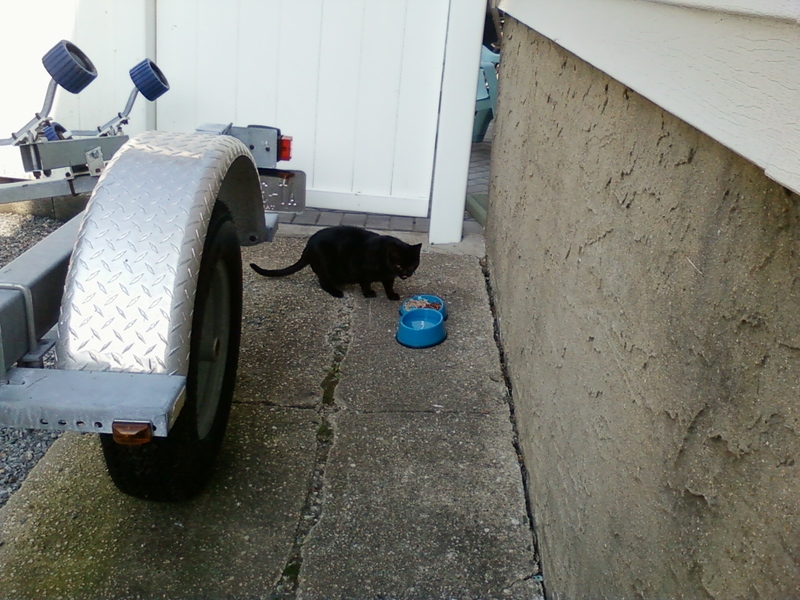 So I guess she is a stray cat. Abandoned, dumped and possibly abused. She already had what looked to be a blind eye. It seems that people should not let cats outside. There are dangers, such as being hit by a car, other animals eating them or hurting them, raccoons, foxes, perhaps coyotes (depending where you live) and worst of all people. People don’t want cats I their backyard. 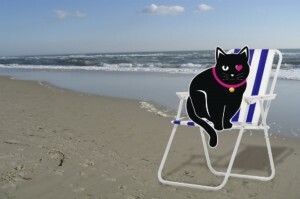 An outside cat will tend to poop where they don’t live, meaning someone else’s house and property. Continuing with our story. We went to home depot to buy a have a heart cage. They are good for the cats and help them be calm. Once the cat is in the trap, you cover it as soon as you can to calm them. So when you trap it is a good idea to do it when you can keep a eye on it so the cat is not there too long stressing out. The have a heart cage we used had only one side to open. Some of them have 2 sides which is good to give you 2 options for the vet when taking the cat out for the first time. I took this responsibility very seriously. It is important to trap and feed cats during day light time so you don’t get raccoons I the trap or eating the cat’s food. The idea was to put in smelly tuna and trap her in there, cover the trap in a blanket and then take her to get her shots and neuter for free at the town. Check with your town or vets in your area. Some charge, but not much, there are discounts for rescuing cats at some of these places. So we went to home depot and picked out the cage and took it home. We still had a long wait for our appointment. We were instructed to trap her the day before, keep her in the cage all night, yikes. And then take her the next day to the town for her appointment. Mine was schedule for 7 a.m. Then you go and pick her up and release her back out to where they came from and live. During this time we had time to research more about cats. It was going to get colder also, so we planned to get the igloo house ready. Decisions to make. Use straw at first as blankets and towels don’t dry if they get wet. We were reviewing heated pads and ways to electronically head the house during the winter. It was now September and closer to my appointment date. More research and decisions. 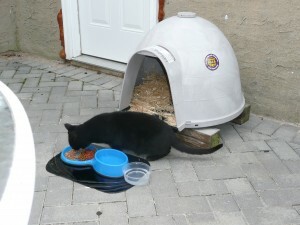 We had finally coaxed Sammie into the backyard with her little igloo house and food set up. Meanwhile, trying to get to know Sammie while we wait for her appointment. Sammie the Cat discussed on David Letterman Shout out to Dave Letterman we will miss you. I found the clip here. Or please search for it with the information below. Enjoy the clip Feb 27, 2014 Episode, Season 20, Episode 862. I am going to make a change in my blog today for special reasons. 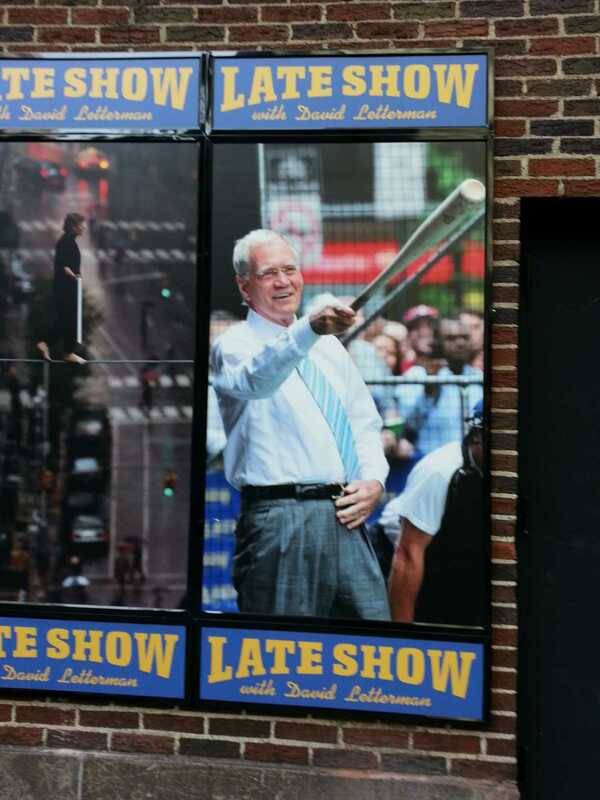 David Letterman is retiring this month in May 2015. Shout out to Dave we will miss him. 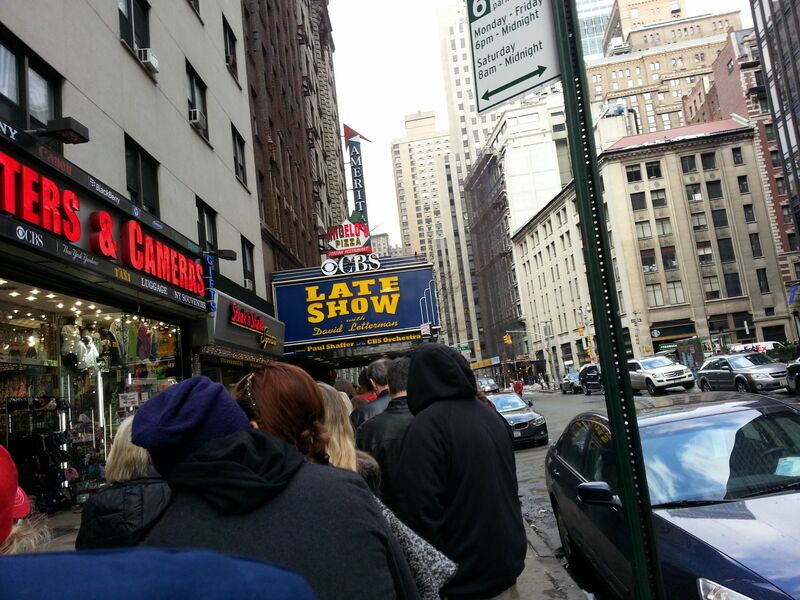 I am a huge fan of David Letterman and was lucky enough to attend one of his shows late 2014. Since he is leaving, I wanted to give him a little tribute in this story as well as share it with everyone. 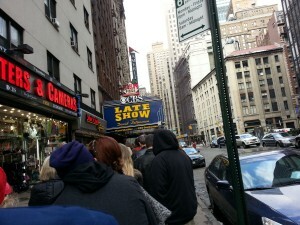 Before David Letterman announced his retirement, I was lucky enough to attend his show. Prior to the show taping, Dave would come out and let the audience ask questions. Well, I always wondered why he never had cats in his stupid pet trick category. Yes, I know most cats are shy etc., but some may be ok, how do I know? So I raised my hand frantically as I really wanted to ask this question. Dave looked at me, and I looked behind him to see who he was addressing. Well, duh, it was me. So I asked him not one question, but two. Have you ever had a cat and why don’t you have a cat in your stupid pet trick segment? Dave asked me back. Do you have a cat? I said yes. He asked me what her name was. I said Sammie. He asked what name? I repeated. Unfortunately, I could not shout it loud enough for him to hear after repeating her name. So he asked me what tricks Sammie did. So I mentioned a couple of cute things she did. He said he used to have a cat in the day when you let your cats out. His cat went missing for a year. One day a neighbor came over and said to them, the neighbor has a cat that looks exactly like your old cat. So Dave said, my cat found another home. FYI, another reason not to let your cat out. So to continue my story with Dave, during the taping, coincidentally, he was reviewing books and the cat in the hat came up. Now I got a mention, and most of the discussion was what was the cat’s name. I am seen for one sec yelling her name. Sammie! Sammie! Ha! Go to the book after Joe Biden, The Cat In the Hat. Next blog will be back to my story. 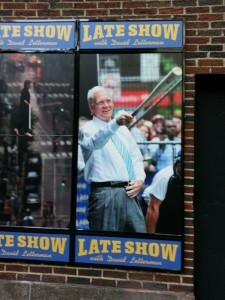 Thank you David Letterman for years of enjoyment and entertainment. Glad we could be part of your show for a quick moment. It was new to me to visit pet stores. I really did not venture in them before. I was picking up food for her and checking out food at Costco and BJs. We were using cheap supermarket cat food as I was told to use the cheaper food. I didn’t think it was the best. Someone told me it was like eating at McDonald’s for cats for value. But we continued to give her the dry and the wet every day. We set up an appointment with the shelter to schedule Sammie for a TNR appointment. This means Trap Neuter and Return. For feral cats (some people use the term for any cats outside, some use it for cats who won’t let people near them that live outside – note not all cats who live outside are shy to people as they may have had previous contact with people) cats who live outside with no in house home, it is important to make sure they do not have more babies and increased numbers of feral cats. They clip one of their ears, so if you see cats outside who have one clipped ear, you will know they were trapped, fixed and released back from where they came. Unfortunately, our appointment was not until October. We were so involved, we signed up for the free class to help out for all trap and releases and learn how to do it ourselves. She came close to me each day as I moved the food closer. I sometime didn’t feed her first and began using treats and create a trail towards me. This way she could come closer and closer to me each day and trust me. This was the beginning and seemed to be working. She looked like she had one blind eye, but could still see through her good one. She was a beautiful solid black color. I think black cats are amazing and so beautiful. I don’t know where the problem came with cats, was it Halloween tradition? There is only good luck with black cats as far as I am concerned. They are just as beautiful as any other cat. For some reason, I hear they are hard to adopt, because of the stigma and superstition about them. From my experience, they are good luck and like all cats, they have unique look about them, just as people do and have different colored hair just like people do. I hope this bad view goes away one day. I decided to name her Sammie. We were not sure if she was a girl or boy, but because of her small size, we thought she was a girl. I don’t have my own children and have never had a pet before due to our family allergies, well, except for turtles, hamsters and fish. Also, Samantha was one of my favorite names, so Sammie was good. I changed the spelling as I felt this was feminine. We kept the routine up of feeding Sammie every day at the same time. Meanwhile, calling the town or asking questions to my friend and people. As I kept using the treats to entice her to come closer, she did. At this point we planned to keep her outside and comfortable. See the picture of Sammie the first place we began feeding her and then when we set up a nice location for her to have an outside home. At this point, we planned to keep her outside and make her comfortable. The little house would keep her warm in the winter, so we picked that up, as well as some straw from Michael’s. My friend Margaret was there to take all my questions, plus I began to drop in on the animal shelter and ask questions there too, in fact I visited a few places, hoping to get advice and learn.